Cheyenne loves the beach. One of our original plans for this trip had been to rent a beach house for us all to stay in on the coast. That idea was scratched when Victoria was announced, since spending time on the beach with a nursing baby is a less exciting prospect. 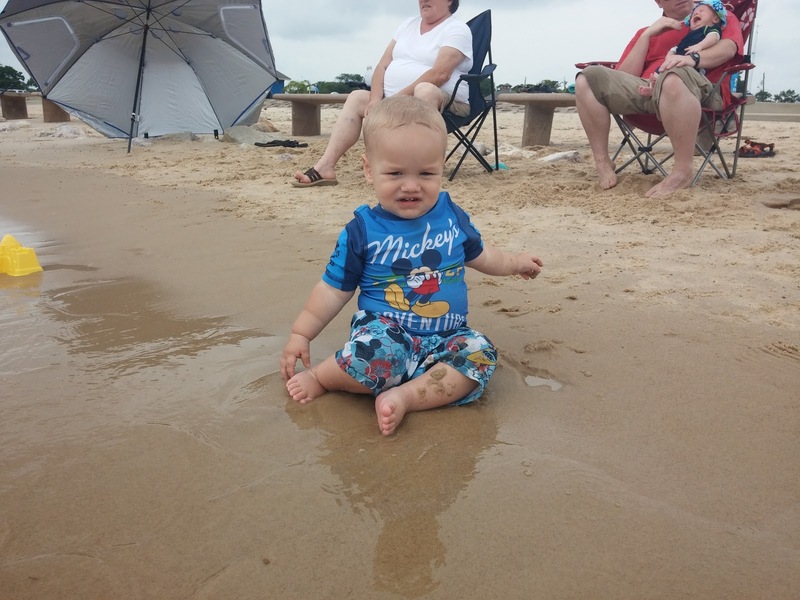 However, with the warm gulf of Mexico only an hour away, we couldn't have a whole trip to Houston without experiencing the beach. 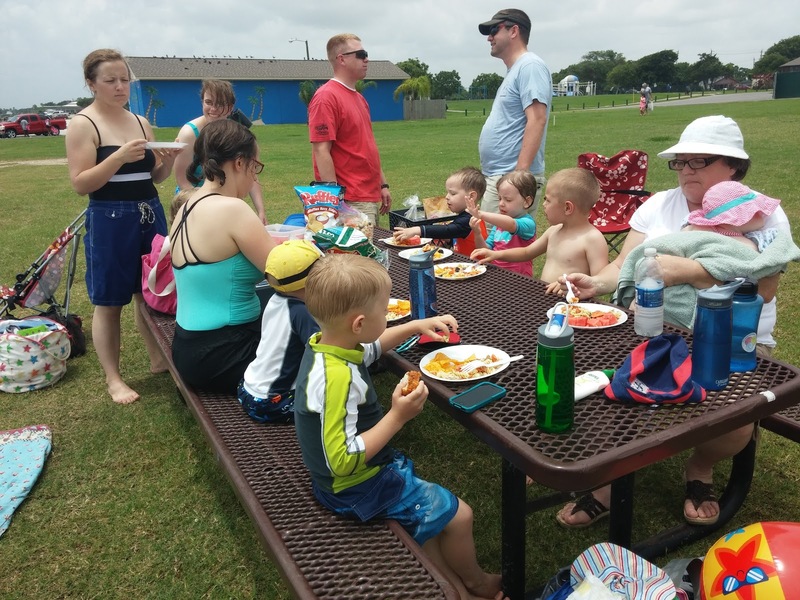 On Friday, June 19, we packed up the whole crew and a picnic and headed to the beach in La Porte. 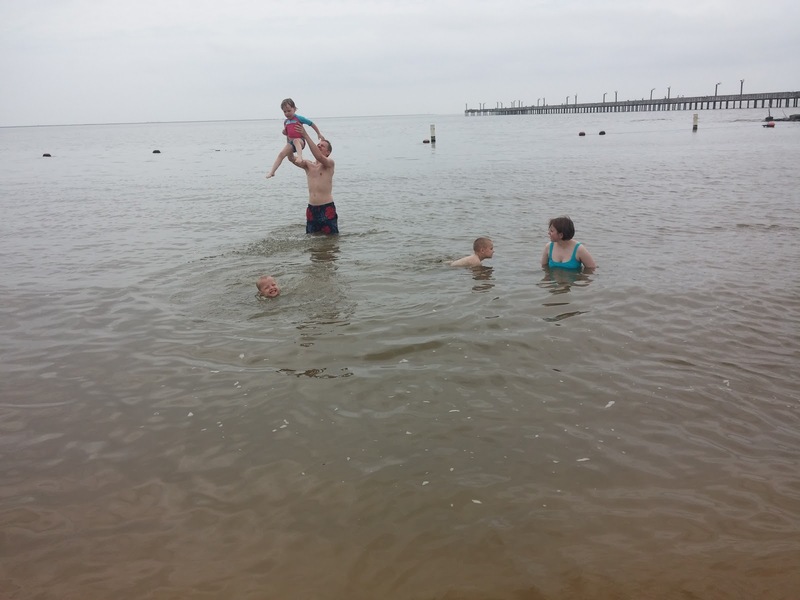 This picture of Cheyenne and Victoria reminds me of this picture of Cheyenne and Aaron at the beach five years ago. Cheyenne is right about the beach not being as fantastic with a tiny baby. Sammy still didn't love the water. By this point in our trip, he had established a fairly consistent habit of attempting to fall asleep as soon as we stepped out into nature. This way he could avoid the discomfort of dealing with heat, rain, beaches, and sunlight. The rest of the Knights hardly left the water for two hours. Maren, who does everything with confidence, marched out into the water until it was up to her chin, untroubled by waves, or silly things like not knowing how to swim. Faith was very helpful at keeping the kids from drowning, and was a great sport about staying in the water as long as the kids were interested in water (read: forever). 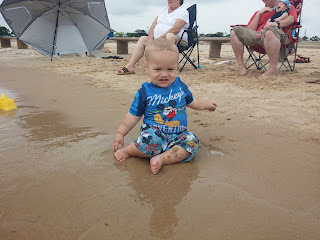 James liked the water, but he and McKay were really all about digging in the sand. I'm sure this is just a phase. I wish I could say the same thing for Andrew and Ryan's avoidance of water. 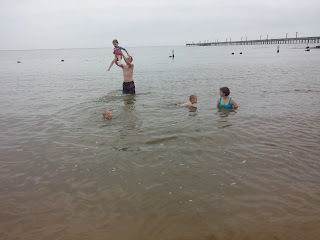 For some reason there was a tractor moving sand around the beach just a few feet away from our tiny children, which was a little nerve wracking, but we still managed to enjoy ourselves. Aaron loves water. He has a tendency to lie down puddles, or get completely soaked in any amount of water he encounters, without giving any thought to the consequences. This reminds me very much of Cheyenne. She hasn't grown out of this tendency. 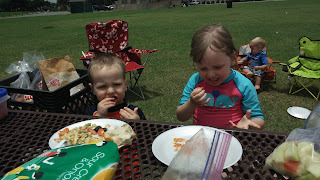 We hauled everyone out of the water for a picnic lunch while the tractor moved sand around where we had been playing. 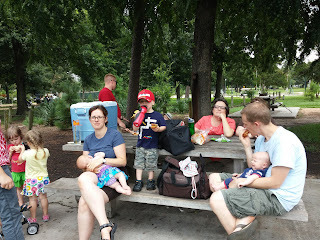 James, Victoria, and Sammy are all nursing babies, so our time in Houston was like one long nursing party. At any given time, one or more of us were likely to be found nursing. Here are Cheyenne and Anni with their little nurslings, and Mama Jill with Sammy in the middle. 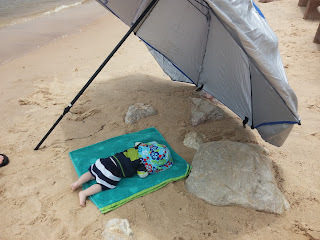 Sammy spent most of the time on the beach sleeping under an umbrella on the sand. 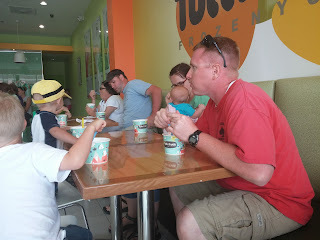 On the way back to Anni's house, just as I was realizing that I had a Texas sized sunburn, we stopped for frozen yogurt. Cheyenne had requested frozen yogurt instead of birthday cake. Friday is movie night, so we watched "Rio 2." 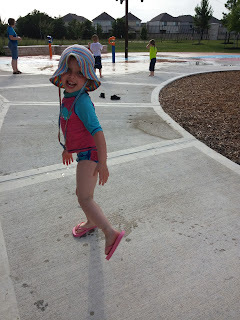 The weather cleared up, so we finally got to go to the splash pad a block from Anni's house. It was a hit. Sammy has a team of admirers in the Jensen family. He didn't mind all of the extra love. For fathers' day, we got Todd some salted caramel root beer, and the kids wore matching t-shirts that say "Knight" on the back and "Team Daddy!" on the front. We put Todd through a lot, but he handles it well. He is the best dad I know. I'm so glad that he is my partner in this crazy job. He is so handsome, too. Andrew had to go home on Sunday, just as McKay was starting to recover from a high fever that hit him out of the blue. B caught it next, and then Victoria. 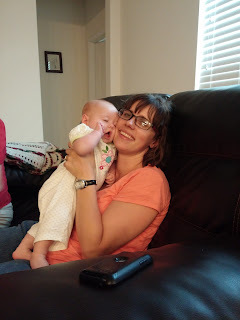 Eloise had it after we got home, and I think Aaron caught it just as we were leaving. 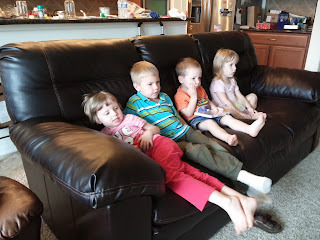 I'm not sure that it is possible to get cousins together without sharing some illness, but this one could have been much worse. It passed relatively quickly. 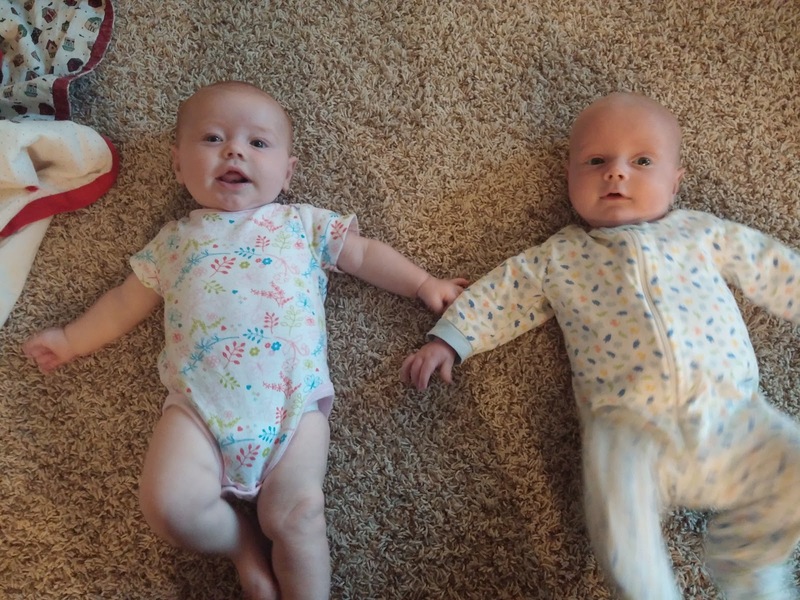 Sammy and Victoria are closer in age than any of the other cousins. Victoria is more talkative and, at six weeks older, more active. 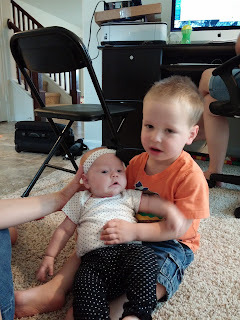 This picture was taken right before she rolled over onto Sammy's head. 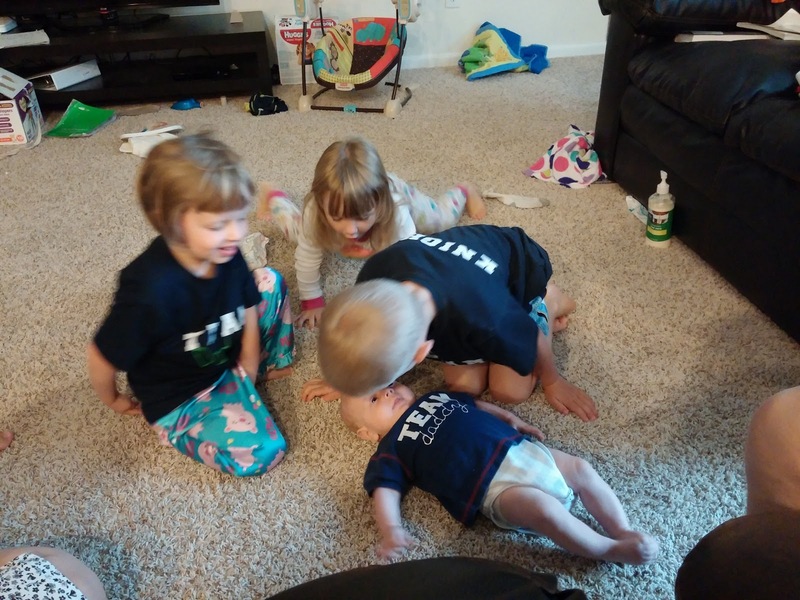 The other kids could not keep the two babies straight. 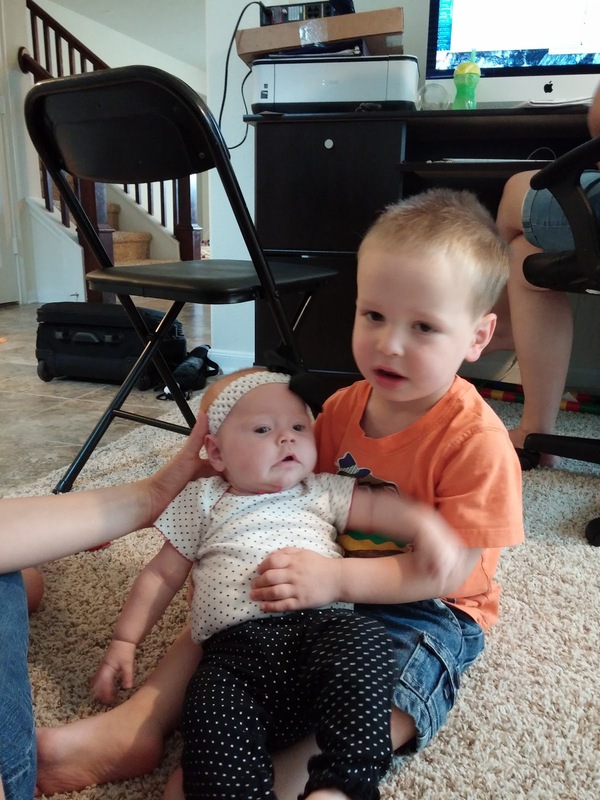 Aaron asked me a couple of times if I was holding Sammy or Victoria. The really obvious difference between them (besides the width of their thighs) is Victoria's red hair and Sammy's barely-there blond hair. Cheyenne looked through my trip photos and complained that I didn't have enough pictures of McKay. 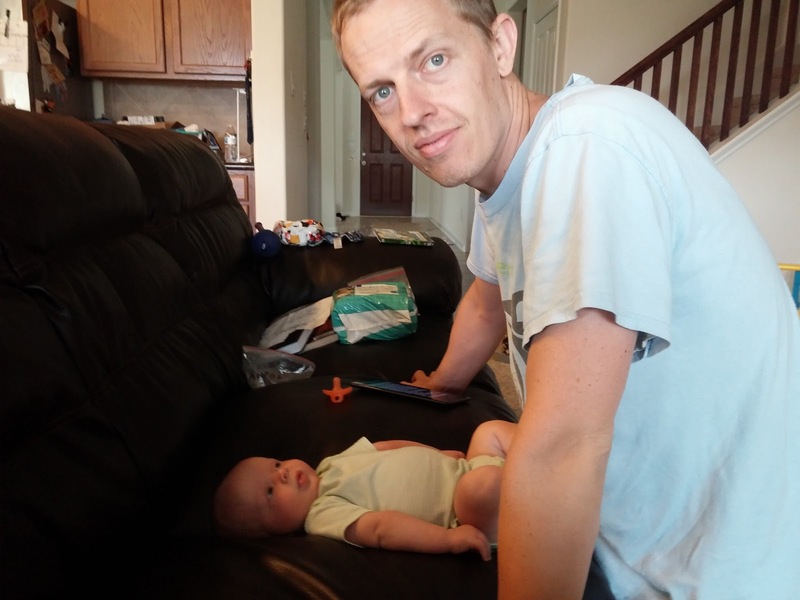 This is mostly because McKay was very shy around me, and any time I approached him, I felt like I had to do it like I was taming a wild animal- moving slowly and retreating when he got too nervous. One day Todd and I were babysitting and he refused to come downstairs for two hours. Finally I heard him crying softly for his mama, so I took him a sandwich, which he would not take until I set it down and backed away slowly. 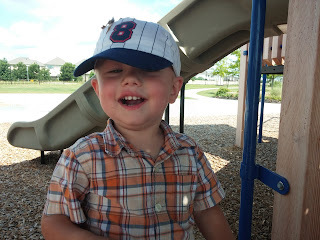 By the end of our stay, though, he was calling me "Aunt Nanannah" and playing with me on the playground. We couldn't get him interested in the splash pad, even when it was crazy hot out, and the rest of us were going in with our clothes on. Before we went to Houston, Anni signed Jared, Eloise, Maren, and Aaron up for a free dance workshop put on by one of Anni's friends. 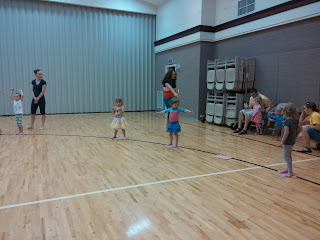 Eloise was SO EXCITED about dance. 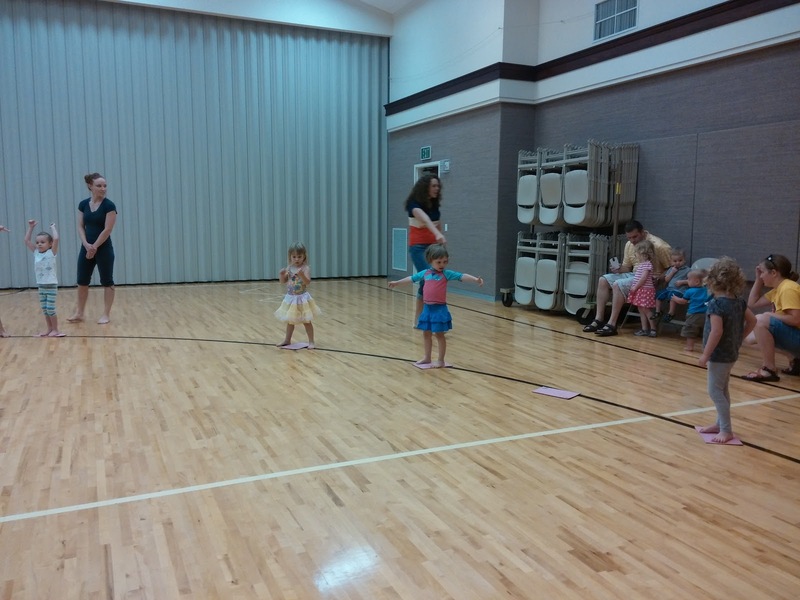 She got to attend three times while we were there, and she is begging me to find her a dance class just like it in Seattle. Eloise even made friends with a little girl who she recognized from primary, which made it that much better. Jared came twice, but opted to go swimming instead of attending the third class. Aaron broke down into a soggy, teary mess at the first class and refused to participate. Eloise was fine, though. She likes to do things on her own. The day before we left for home, we realized that we hadn't been to the pool yet. 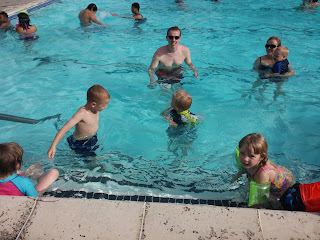 We didn't want to leave with pool regret, so we squeezed in a pool trip after dance. Jared's swimming lessons are paying off. He was dog paddling around in deep water with great confidence. When we left the pool, somehow Todd drove away with the car keys to Cheyenne's car, which I had been driving, and with my phone. A friend of Anni's happened by (we were blessed once again by Anni being social) and took Anni home for the keys, which no one could find. Apparently I am the only one who can find things in my diaper bag. Todd came back and picked us up, I located the keys (right where I had said they were), and the car was rescued. 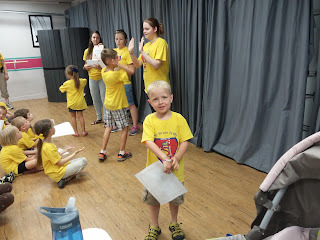 For the last three days of our trip, Aaron and Jared went to science camp put on by Anni. Cheyenne came to help. The boys loved it. 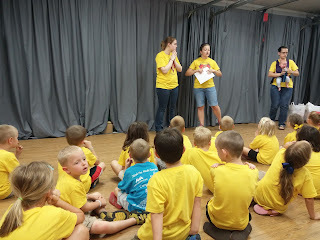 Anni worked really hard to make the camp a success, and it was. The kids dyed carnations, exploded diet coke, made foil boats to carry pennies, dyed milk, made ice cream, ate pizza, and did a lot of other cool science things. Jared and Aaron came home happy and exhausted every day. Jared got covered in mosquito bites, but he didn't mind. He says he wants to go to science camp again next year. I really think that camp was the highlight of Jared's trip. Annika and Cheyenne were tired and stressed, and they had a lot of challenges, but the kids had a great experience. 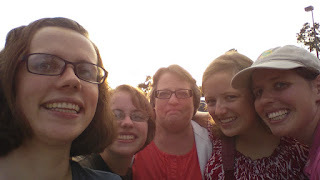 An hour after Jared's camp graduation, we headed to the airport to fly home. Anni managed to get back to her house just in time to say goodbye after one of her 17 year old camp workers got rear ended as she was leaving camp, so Anni stayed behind to help her. Todd dropped off everyone except B at the door of the airport and returned our rental car. 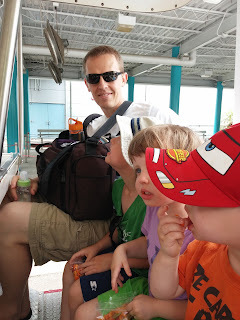 B was delighted to have one on one time with Daddy, and to ride a bus from the rental place to the airport. Houston airport security was tougher than Seattle. I had to have my hands, my bottles, and my diaper bag tested for bomb residue (because I carried a baby through the metal detector- what? ), and Todd didn't realize that he was supposed to take his laptop out of his backpack, so that got tested, too. Everyone had a good flight home, even though it was very late. Rebecca picked us up at the airport in our car. We got everyone installed in their car seats and took the car the the cellphone lot while Todd tracked down a missing gate checked bag. Eloise and B fell asleep promptly. This morning Eloise asked me why we had made Daddy walk home from the airport, since she had no recollection of driving back to the terminal and picking him up, and then sitting beside him for the drive home. Sleepy babies are a result of a successful outing. Happy 30th birthday, Cheyenne! I wish we got to see you more. One of the things were were very excited about in Houston was the chance to go to the space center. It was a very hot and damp day, and I totally forgot to bring a bottle for Sammy. Walgreen's to the rescue! 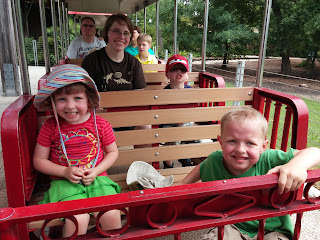 Here we are sweating on the tram tour. It was very cool to see mission control, and all of the buildings where innovation and space exploration happen. I especially liked memorial grove where an oak tree is planted in honor of every astronaut who lost his life in space. The tour was not too long, but the kids got hot. By the time we got into this building to see the Saturn V rocket, Sammy was overheated and grumpy, and Eloise cried when she learned that she wouldn't get to ride in the space shuttle. Life is pretty hard sometimes. She cried a lot. So did Sammy. And then it started pouring rain. All of the kids calmed down and were fairly happy for our picnic, but as soon as I picked him up again, Sammy got fussy, and that was basically the end of seeing the space center for me. I will have to go back again when Sammy is older. Todd took the kids around to see the exhibits. Eloise wants to be an astronaut when she grows up (to get that ride in the space shuttle). Jared only got lost once, when he stopped to read an informational sign and we walked on without him. A kind stranger returned him, and he was slightly more careful from then on. 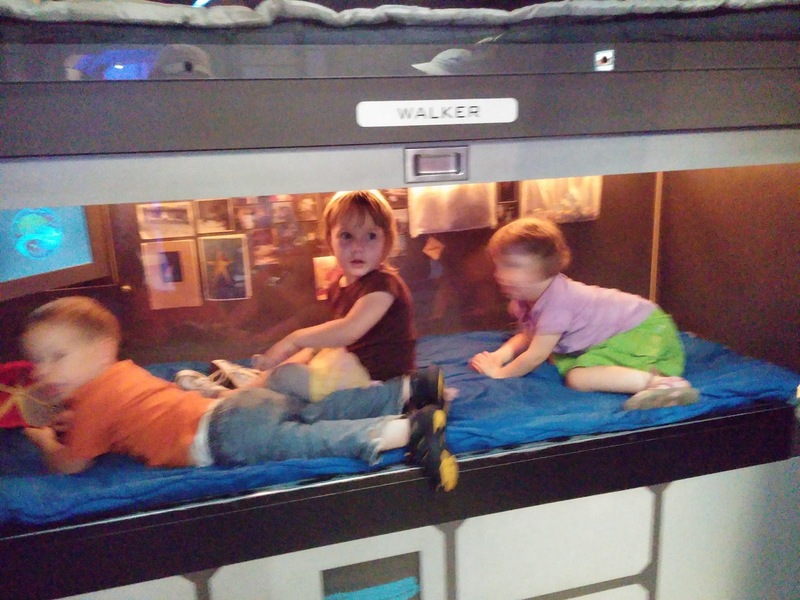 Quarters on the space station do not look quite so cramped when the astronauts are two, three, and four years old. 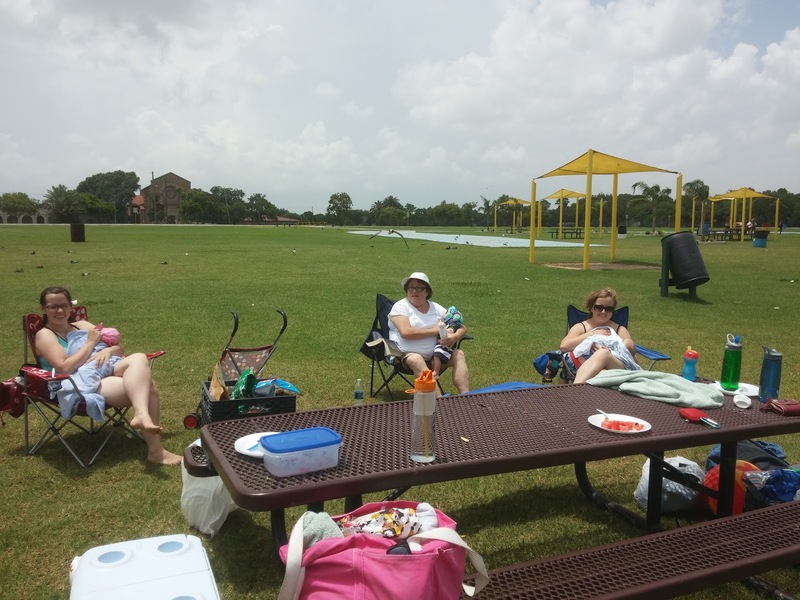 We left when the kids got tired, got slightly lost in Houston, stuck in traffic, and arrived home just slightly before everyone else. 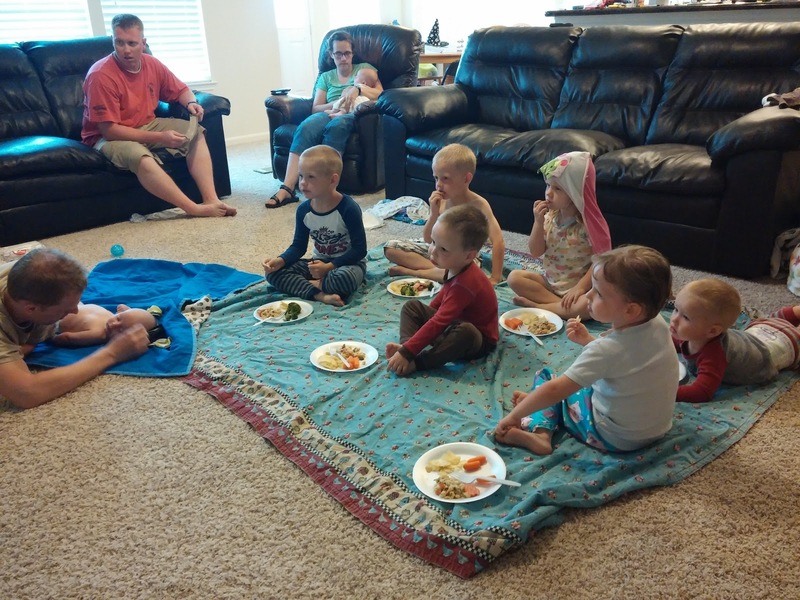 The weather report told us we were in for a soaking from tropical storm Bill, so we hunkered down (16 of us in one house) and waited for the storm to begin, but apparently it missed us, because the weather never got windier or wetter than it had already been. We are not completely inept at keeping secrets. Cheyenne had no idea that Faith would be coming. When she arrived on Tuesday, Cheyenne's first thought on seeing her was that she was having an out of body experience and looking at herself from across the room! It was amazing to have us all together. Now the fun could really begin. We all took it in turns to go to the Houston temple, which is very beautiful, and not far from Anni and Ryan's home in Spring. Cheyenne wanted to show off her selfie face with Victoria, but Victoria was more interested in eating Cheyenne's face. Todd kept the kids entertained with a little "Faster than Light." 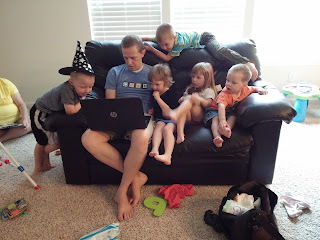 The children flock to him and his computer like moths to a porch light. He is the pied piper. Notice Aaron draped over the back of the couch. 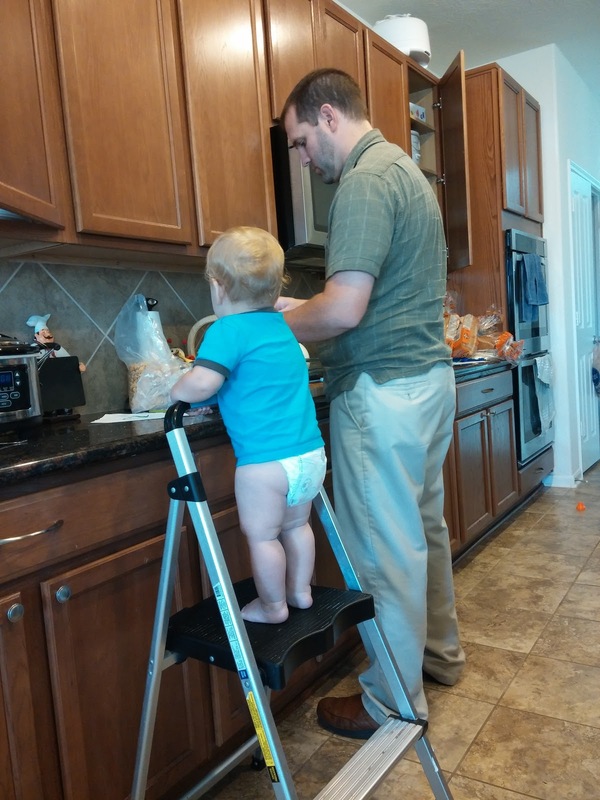 I think his motto in life is "Have limbs: must climb." B loves Sammy, and he loved Victoria (or Tutoria, or Tatortilla as he called her). 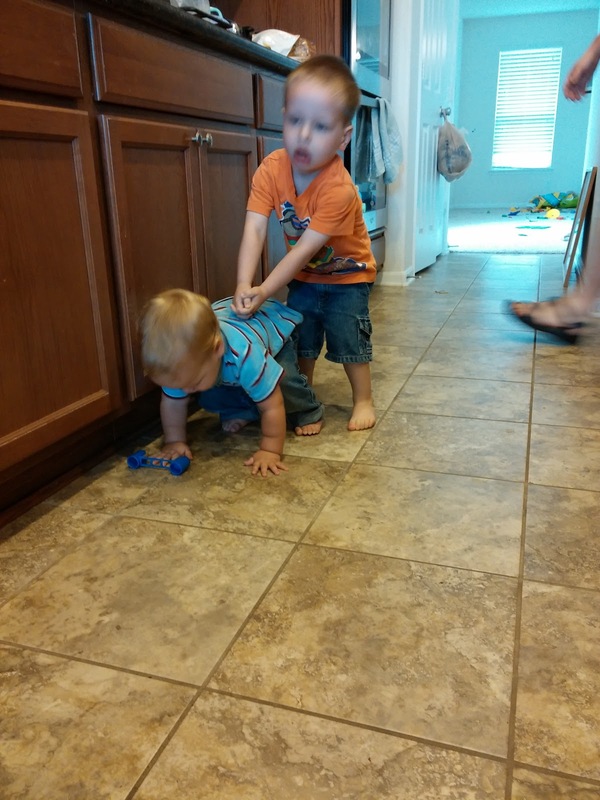 B was not terribly fond of James, who is too much the same size as he is, and therefore threatening to his status. 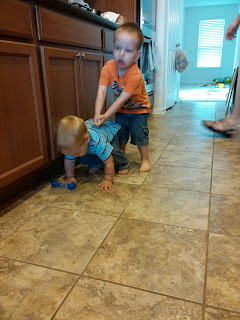 There was a lot of B pushing James going on. Little stinker. 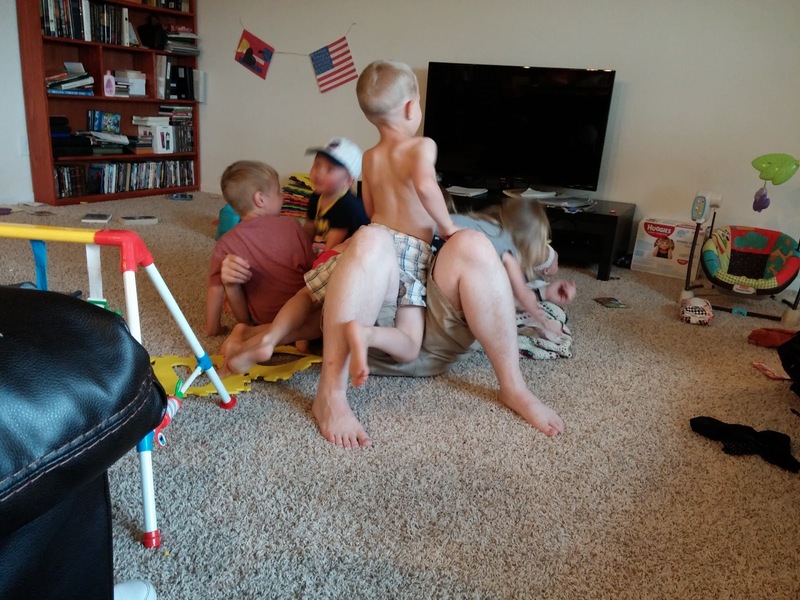 Try explaining to a two and a half year old that his hefty one year old cousin should be treated like one of the babies. He wasn't buying it. 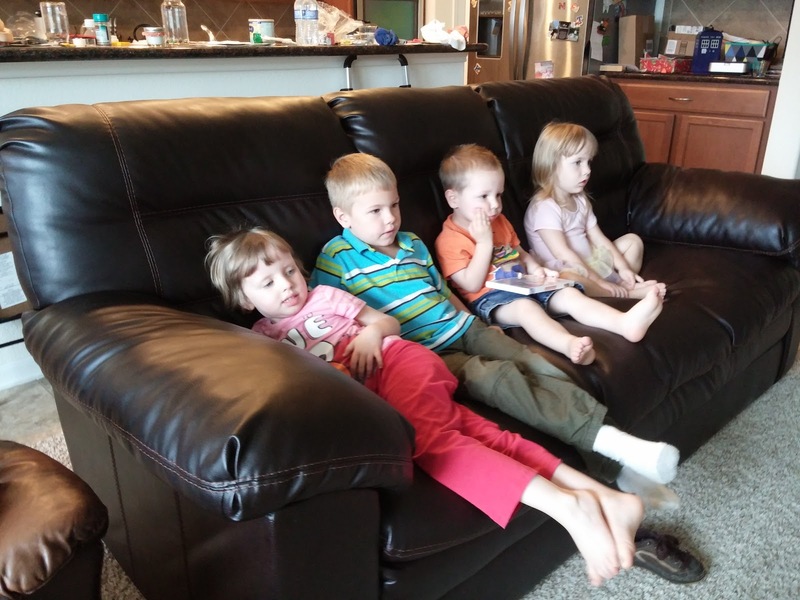 With seventeen of us in the house (9 children), we resorted to extremes to keep the peace. In this case, episodes of "Bill Nye the Science Guy." That was the only show that all could agree on. I took this picture of James and Ryan because I know that we will never believe that James was this fat in a few years. He is a cuddly little guy. 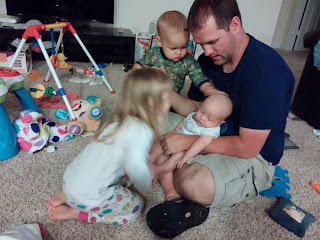 Another favorite activity was tackle Uncle Andrew. 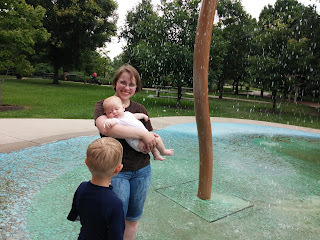 For Cheyenne's birthday, she wanted to go to Hermann Park in Houston. 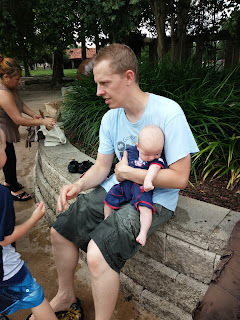 We were all agreeable, even though it was extremely hot. 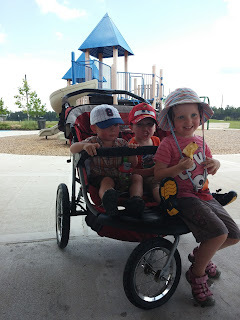 We arrived at the park and found that we had a message from Cheyenne that they had a flat tire and would be delayed while they filled it with air. 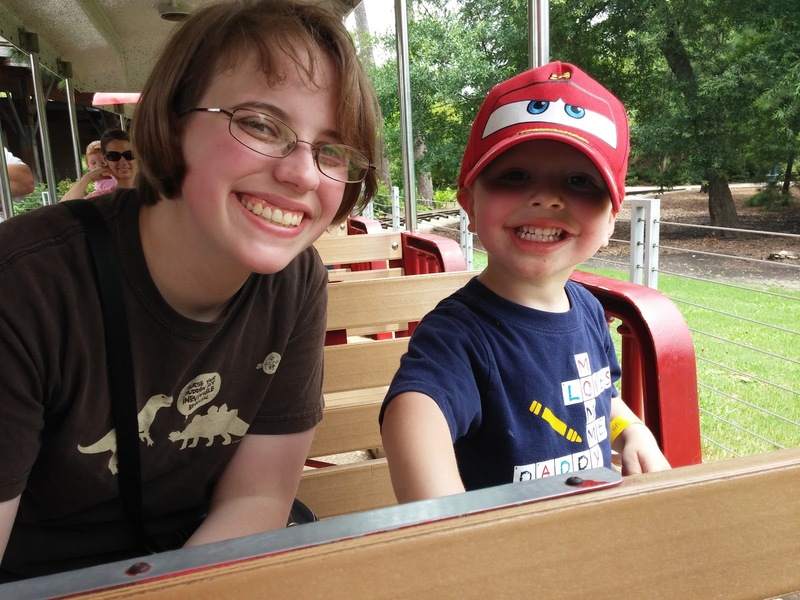 Then the tire broke and they had to put on their spare, so we had plenty of time to ride the train around the park without them. B was in train heaven. And Aunt Faith heaven. 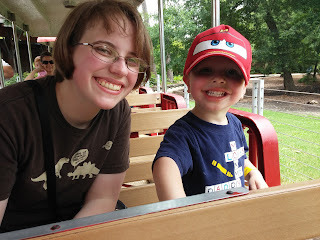 He told me all about how we were on the train on the train tracks! We even went through a "tunnel," which was actually a train shed with murals on the walls. Sammy was fussy in the heat. When Cheyenne's family arrived with our lunch cooler, we sat down to eat and Sammy guzzled a bottle. 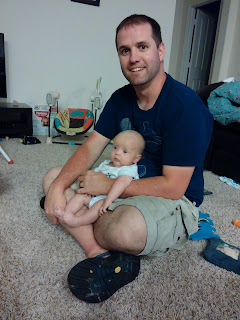 After that he was calmer. 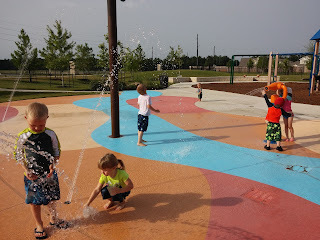 After lunch we cooled off in the splash pad. It was so hot that even Sammy (who is still pretty sensitive to wind and water) didn't object to getting a little wet. Nicole came to meet us, and we all had a refreshing splash. Hermann Park is pretty cool. 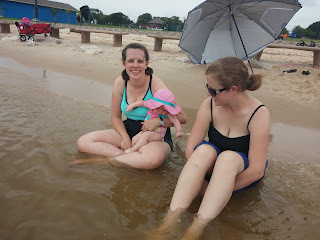 Sammy tolerated the water, but Victoria loved it. We managed to find our way back from Houston to Spring without getting lost this time. I hope that these two will be the best of friends. We had a girls' night trip to the movies for Cheyenne's birthday. We went to see (and make fun of) "San Andreas." It was utterly ridiculous. We probably ruined it as an action movie for everyone else in the theater with our occasional guffaws that we could not suppress. And now. . . we rebuild.